Mental health among New Zealand men is a serious issue – and we don’t talk about it enough. Despite various campaigns to educate us on the facts, many view it as a character flaw – a weakness that “taking it on the chin, hardening up and pushing on” will overcome and from which we will grow as men. This, despite no factual evidence to support the assertion. The fact is that mental health issues can affect anyone, regardless of age, social status and gender. And a lack of awareness about one’s mental state can exacerbate matters and add more serious complications if not addressed. Triggers are many and varied for men and can include anything from family, business and even sport failure, physical injuries, major life changes (getting married, becoming a father), to redundancy and financial issues. Even waking up one morning and discovering you’re nearly 60! To raise awareness following ‘Movember’, Takeuchi New Zealand, a subsidiary of Hunter Powell Investments, are proud to support Sam Dowdall, widely known throughout New Zealand as ‘The Barter Barber’. 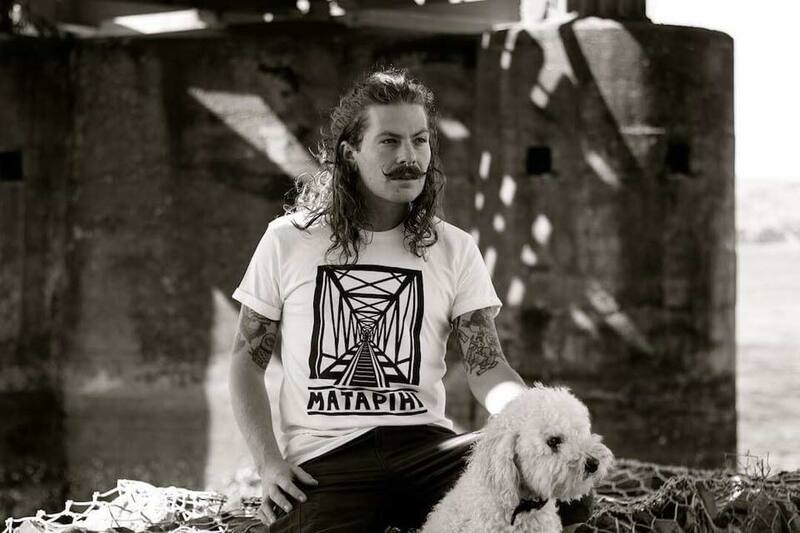 Sam travels the length and breadth of Aotearoa with his poodle companion Bo (the Barter Barker) giving men haircuts in exchange for the necessities of life. Food, water and petrol feature highly, as does the occasional hot bath and cold beer! The haircuts are good, very good. But it’s the conversation that makes the real difference on a deeper, less visible, level. While Sam cuts, he chats to Kiwi men about communication, mental health and masculinity, and how the social constructs currently in place are damaging to how men treat themselves – and others for that matter – when the going gets tough. Takeuchi New Zealand has supported Sam to make his journey a little bit easier. “We believe Sam is on a very necessary mission, dedicating his time and skills to impact New Zealand men in a positive way” says Tenby Powell, Director of Hunter Powell Investments. “We were able to assist by replacing the engine in his vehicle, then a 1971 Bedford truck, which was an interesting challenge to say the least. Now we are now servicing his new vehicle free of charge in the Christchurch branch of Takeuchi New Zealand. Sam does a lot of miles in his quest to reach and help men, and we want to keep him running smoothly and play a small supporting role in supporting his journey”, says Tenby Powell. And what a journey it is! Sam has recently upgraded to a motorhome which the mechanical team at Takeuchi New Zealand will continue to keep on the road and in safe running condition. I travelled to Christchurch to meet Sam, get a haircut and, naturally, we had a yarn. 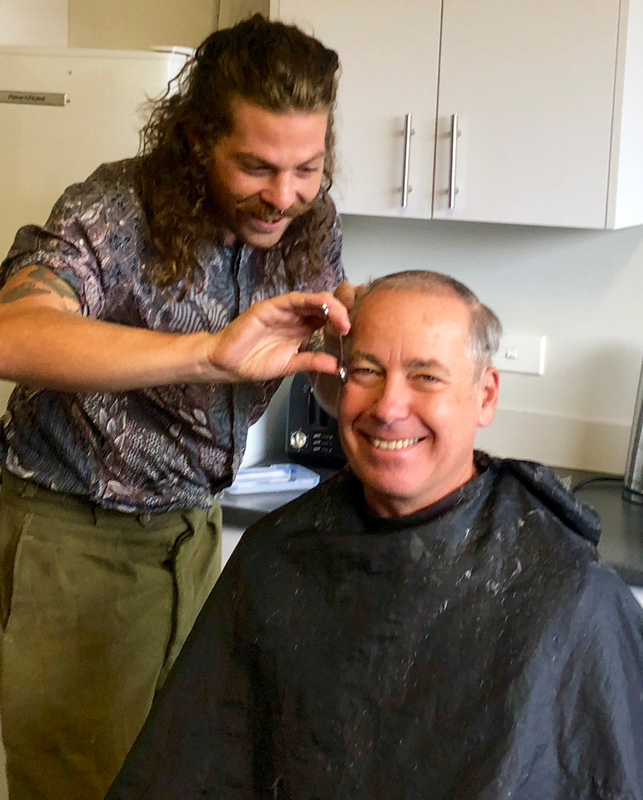 George Powell (Hunter Powell Investments): Sam, what initially made you want to begin this mission of trading haircuts for conversations around mental health? Sam (The Barter Barber): There are a multitude of reasons why I started on this mission: from funding being cut to Lifeline from the previous government, through to losing friends and clients through suicide. Furthermore, seeing the increasing divide of the rich and poor in New Zealand, with our ever-increasing wage gap. But above all, it’s the frustration I see in men – the anger and the pain. Much of it comes from having to “man up” or “harden up”, and not being afforded the space to be heard or experience the full scope of our emotions, in fear of being at risk of being a “wimp”. George: Why is helping Kiwi men to better understand mental health so important to you? Sam: Mental health is important to me, because it’s important to us. We often hear of mental health and we naturally of think mental illness. Mental health is something we all have 100% of the time – just like our physical health. And just like our physical health we have to maintain it with exercises, in the form of positive social interaction and sharing emotional loads. 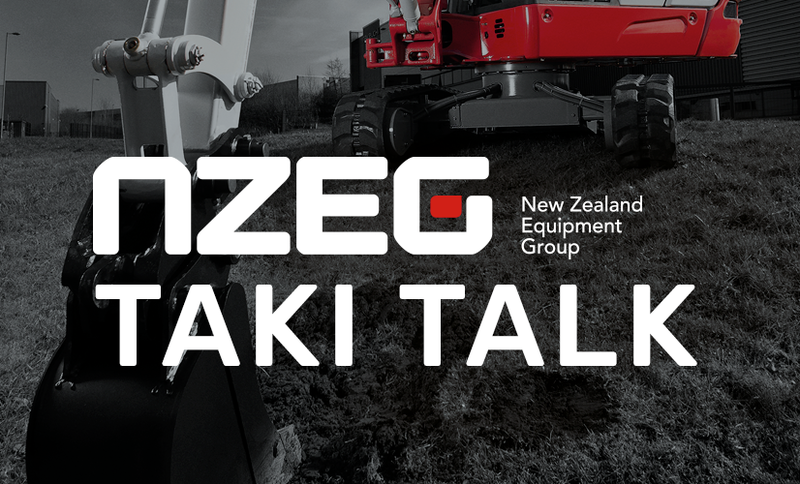 George: How did you first get in touch with Takeuchi New Zealand? Sam: I came into contact with Tenby Powell, of Hunter Powell Investments, through a plea for help I was making over The Rock FM radio station. My truck, which also acts as my house and my workplace, was breaking down every couple of hundred kilometers and needed a new engine! Tenby gave the station a call and organized a replacement engine, and this was before I had even met him! George: What’s the biggest way Takeuchi New Zealand has helped you? 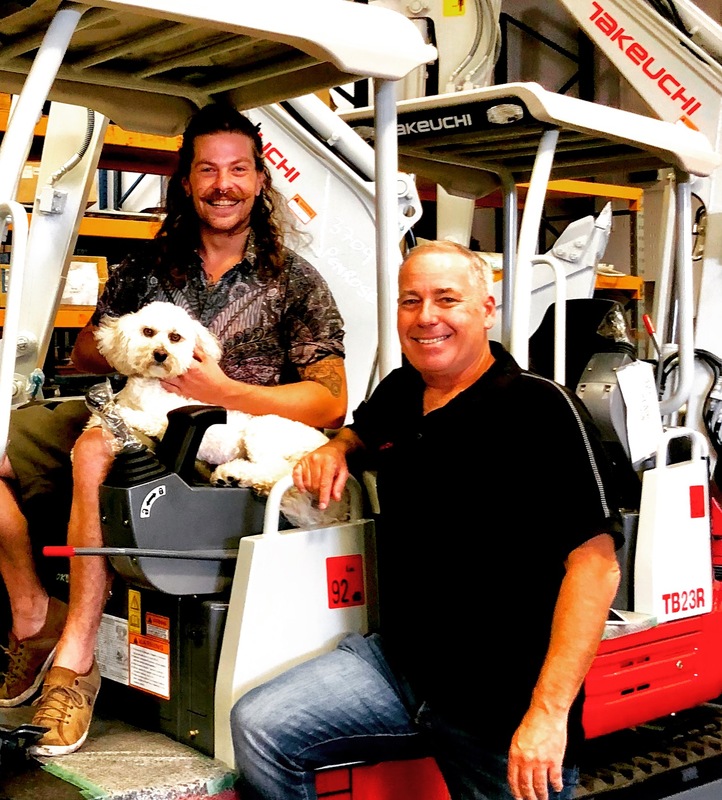 Sam: The Takeuchi Team has helped by servicing my truck to make sure its roadworthy and can continue to act as a home for me and Bobo, taking us right into the hearts of rural and urban New Zealand. Vaughan Wright (General Manger of Takeuchi NZ) and Murray O’Donnell (Christchurch Mechanic) have been incredible in their support. At times, even picking me up from the bus station when I’ve been stranded! George: What are your thoughts on the current climate surrounding mental health among kiwi men compared to when you started? And what can our brothers do to help the cause? Sam: I was standing on the steps of parliament 18 months ago, fighting back tears as I looked over the parliamentary lawns where 606 pairs of shoes lay, representing the previous years’ suicides. Over six hundred in New Zealand alone! I stood next to survivors, friends and family who were bereaved. As a nation, we were crying out for an enquiry into our mental health system. After I was able to speak, the then new leader of the Labour party, and now our Prime Minister, Rt. Hon. Jacinda Arden, spoke. She spoke with passion and promised an inquiry into the mental health system. A week after this, she became our Prime Minister, and followed through on her promise. I brought a group of people with me from my hometown, Mount Maunganui, to give submissions and, finally, we were heard. From my grassroots perspective, the mental health system is over worked and underfunded. But the crux of it for me is our isolation. We’ve never been so connected and yet so far away. You can be surrounded by people, or be highly connected digitally, and yet feel completely isolated. You feel like you’re not been heard. This is the start point to begin dealing with this – and at a community level first. Helping your brothers and sisters, simply by listening to them goes a long way. We don’t have to fix the issues in the lives of others but enabling people to feel heard and understood is the greatest communion we have on this earth. For more information on Sam, and to support his work, please visit his Facebook page. If you are considering suicide – please dial 111 and ask for help.